Have you noticed lately that your back hurts and you can’t focus on your work properly? Perhaps it’s time to make an investment in the health of your back. Sitting in an ergonomically designed chair will reduce the amount of fatigue and make you more effective at work. Even though in most cases people opt for office chairs, lately there’s been a growing trend where people choose gaming chairs even if they don’t intend to use them for gaming purposes. The Gaming Chair from Furmax is one of the models that definitely deserve your attention. 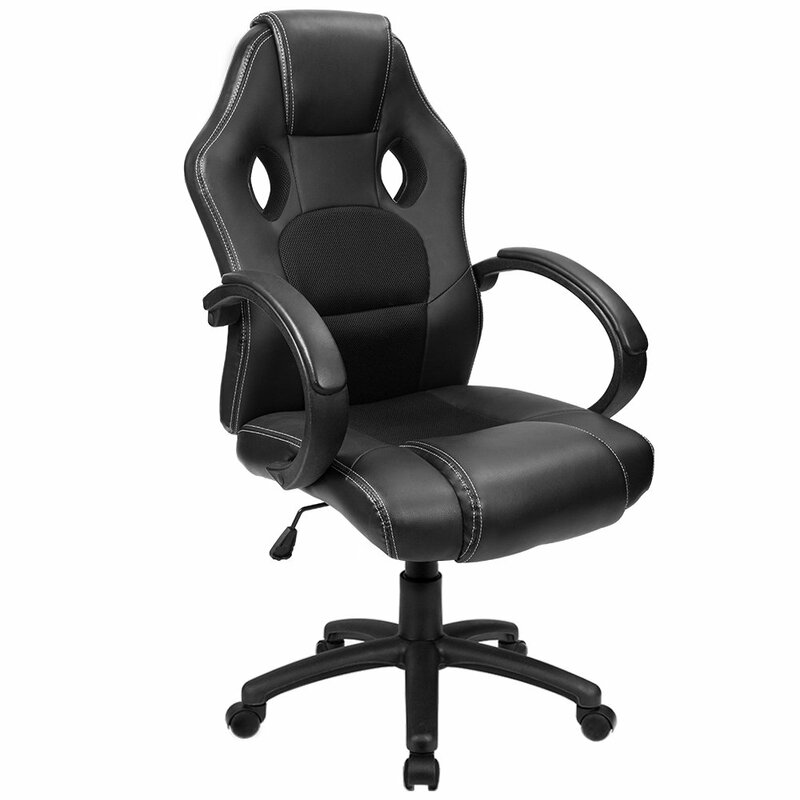 Furmax is widely recognized as one of the leaders in the field of gaming chairs. It’s designed for passionate gamers and inspired by seats from racing cars. The ergonomic design is meant to provide you with exquisitely comfortable seating experience, both for playing video games and simply working at your computer. If you’re a passionate gamer with a thing for various racing games and driving simulations, you will love this chair, as its design is inspired by the design of racing car seats. If you’re not into video games, but spend a lot of time working at a computer, you will highly appreciate the advanced comfort features this chair provides. If you’ve purchased premium office chairs before, you’ll probably know that in most cases they came pre-assembled, but unfortunately that’s not the case with this gaming chair from Furmax. However, the assembly is not that complicated really, and you also get all the installation hardware, tools and the manual included. Obviously, the first thing you’ll notice about the chair is that it looks like something that would belong in a racing car. The bright blue color in combination with the black PVC leather really looks dynamic, like it’s going to be fast even while standing still. Even the wheels are designed so that they resemble 5-spoke wheels on a sports car. Some people might consider it a bit too childish to put a chair like this in a corporate office space, which is basically the only major issue one might have with it. Getting right down to business, let’s now discuss the adjustment options and features. At this price range, it is close to unbelievable how much lumbar support you get. The pillow you get with the chair can be adjusted easily, and it provides just the right amount of cushioning. The armrests feature quite a hefty padding, and they can be adjusted for height, but unfortunately that’s the only adjustment that you will get. For multiple direction adjustments of armrests, you will have to reach for another, pricier chair. As they can’t be adjusted to the left or right, you might need to readjust the positioning of your mouse and your keyboard. The ergonomic headrest is also included in the package, which will come in very handy to prevent neck muscle fatigue. It can also be moved up and down, so will fit any person’s height. The backrest angle can be adjusted for anything between a 90-degree and 180-degree angle, which means you can even lie down. The whole chair height is easily controlled by a lever located below the seat. You will find another very clever feature down there: the reclining footrest. Just grab your joypad or wireless keyboard, sit back and relax your legs. It’s a feature you will also find on the backseats of very luxurious limousines. The maximum weight capacity of the chair is 310 pounds, and it also comes with a 30-day money back guarantee that will cover any problems related to build quality. Also, any installation problems and replacement parts issues will be covered for free in the first six months after the purchase. Chairs like these come with numerous adjustment features, so you can’t really expect it to perform at its best right out of the box. The best way to get the most out of it is to experiment with all the adjustments until you reach the perfect combination that fits your body and your posture. If for some reason you don’t like this particular gaming chair, you can opt for another one, for example the SL4000 from Vertagear. This is their mid-price chair that has become quite popular, mostly due to the fact that it provides numerous adjustment options and quite a comfortable seating experience at a price that won’t break the bank. All things considered, the Furmax Ergonomic Racing Chair is a mighty fine gaming chair that will surely make all your gaming sessions extremely comfortable. Even if you’re not an avid gamer, you can appreciate its qualities when you sit at a computer for hours on end, as it will save your back, prevent fatigue and even improve the overall quality of your health by encouraging proper posture. It comes at a fairly competitive price and is an investment, especially if you spend most of your time sitting down.